From stunning, sweeping views to mysterious ancient petroglyphs, the strenuous Arkaquah Trail explores incredible landscapes on the slopes of Georgia’s tallest mountain summit. 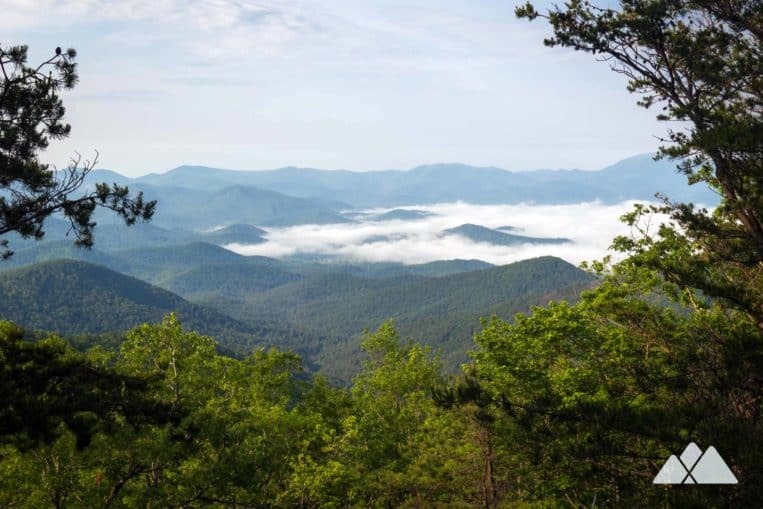 The adventure begins near the summit of Brasstown Bald, rolling elevation on a ridge and catching views from multiple peaks. The trail is especially stunning in winter when deciduous leaves have fallen, opening beautiful views throughout much of the trail’s length – and it’s been a longtime favorite on our list of Georgia winter hikes. The trail’s end at Track Rock Gap visits an ancient archeological site, where six smooth, soapstone boulders are etched and carved with primitive symbols. Experts believe the petroglyphs were created over a thousand years ago, and they’re cited as one of the most significant discoveries of Native American rock art in the South. And it’s at Track Rock Gap that this adventure’s true workout commences, as the hike flips in reverse to make a nearly unrelenting return to the mountain’s towering summit. With gorgeous views, incredible Native American history, and a heart-pumping workout, this is one amazing North Georgia adventure. TRAIL UPDATE – JANUARY 2019: Strong winds have caused a number of fallen trees along the trail. In some of the more narrow passages along this route, the trees have made it difficult, if not impossible, to pass. The hike begins at the mountain’s main parking area (view maps and driving directions), beginning at the signed Arkaquah trailhead. The trail crosses a trickling creek, dropping elevation into a dense canopy of rhododendron that shade mossy boulders below. The hike follows a short side trail to an overlook at one mile, scrambling over a flat rock outcrop to catch the first of many long-range views on this adventure. Departing the overlook, the trail rises to cross a massive, lichen-covered rock outcrop in a clearing at 1.3 miles, with views extending south. 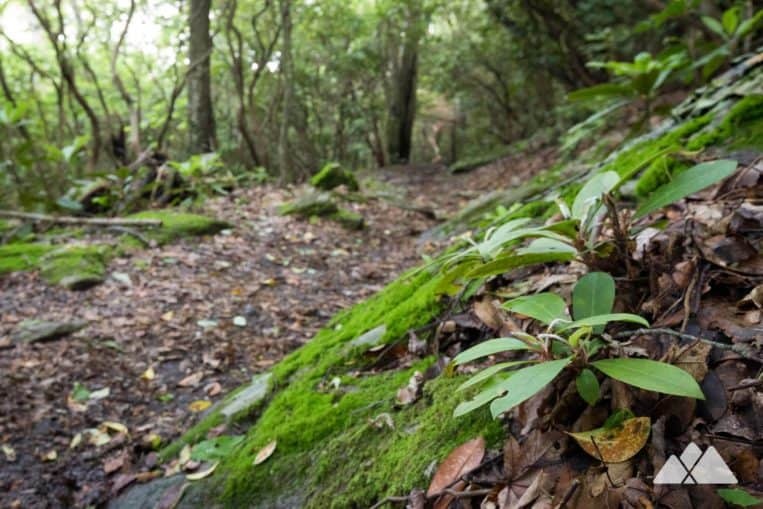 The trail descends from the outcrop, diving into a canopy of mountain laurel and rhododendron. 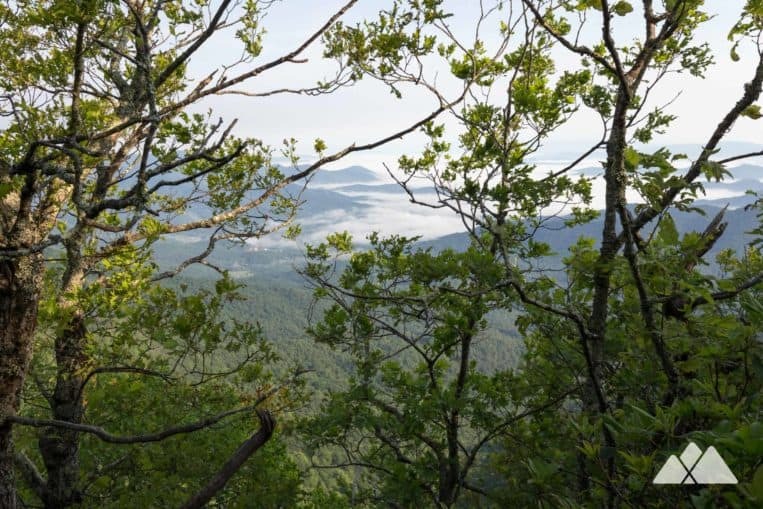 The hike follows a side trail to the left at 1.7 miles, descending to an overlook that offers extensive views of the blue-cast, rolling Appalachians to the south. The trail carves into Brasstown’s rocky ridge line, following meandering switchbacks as sporadic large boulders pepper the path. Trickling streams flow across an overhanging, mossy rock outcrop, dripping to lower elevations – and in frosty weather, lining the trail with crystalline icicles. Through-the-trees views extend to the green valleys below and the rolling Blue Ridge Mountains on the horizon. The trail reaches Low Gap at 2.6 miles and then climbs a small ridge. The hike dips elevation to meet Cove Gap at 3.4 miles, rolling through alternating landscapes along the rocky, craggy, fern-filled mountaintops on the ridge. The trail ascends once again, climbing through a tunnel of mountain laurel and cresting an unnamed knob at 3650 feet. Fern and lichen-covered rock dominate the mountain’s top, and several large, exposed rock outcrops provide excellent vantage points of the farmland-dotted valley below. 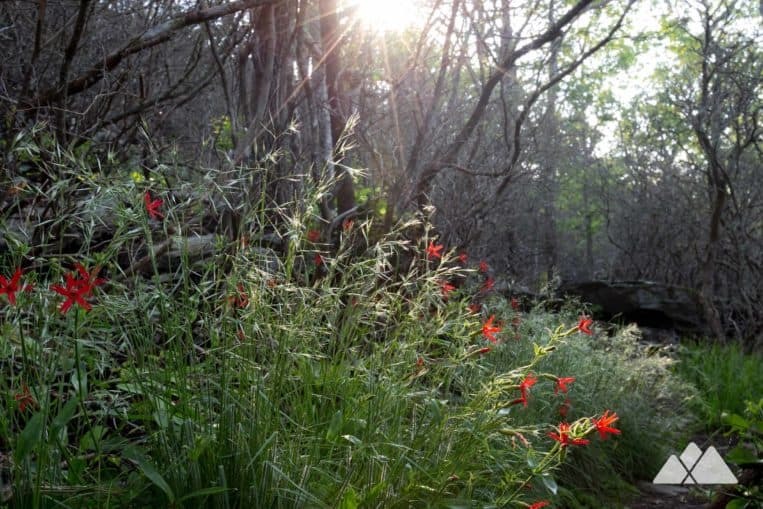 Tall grasses and colorful wildflowers stretch toward the forest canopy, basking in the sunlight. 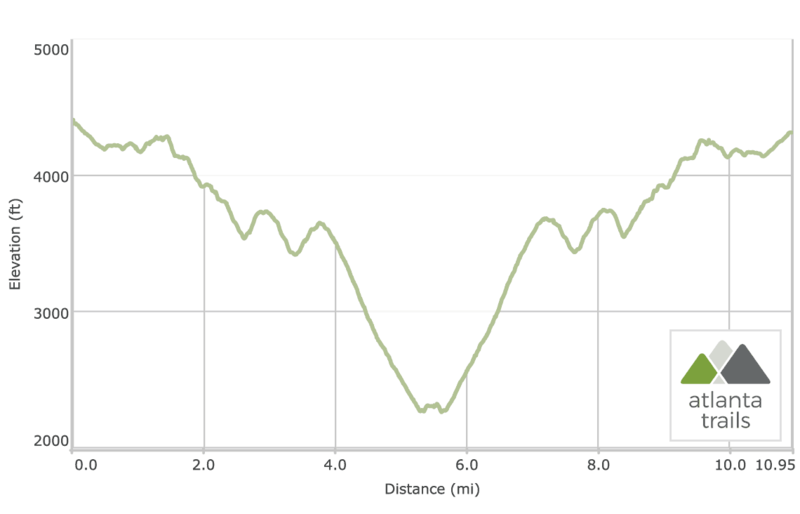 The hike arcs to the southwest, and then veers northwest, switching back as it descends elevation. The trail descends more than 600 feet through a series of switchbacks before beginning a straight-shot, steep drop toward Track Rock Gap. The Arkaquah Trail meets Track Rock Gap Road at 5.25 miles, having descended a continuous 1375 feet over the last 1.5 miles. Departing the petroglyphs, the hike retraces its outbound steps to the Brasstown Bald trailhead. The ascent from the gap is an intensely difficult, calf-burning climb to the ridgeline, unwavering in its steady climb to the summit. It’s a great workout, to say the least. This stretch of trail is easily one of the most difficult we’ve followed in Georgia. The trail levels at 7.2 miles, beginning a short, yet refreshing, downhill finale to the trailhead, rolling elevation to the finish. 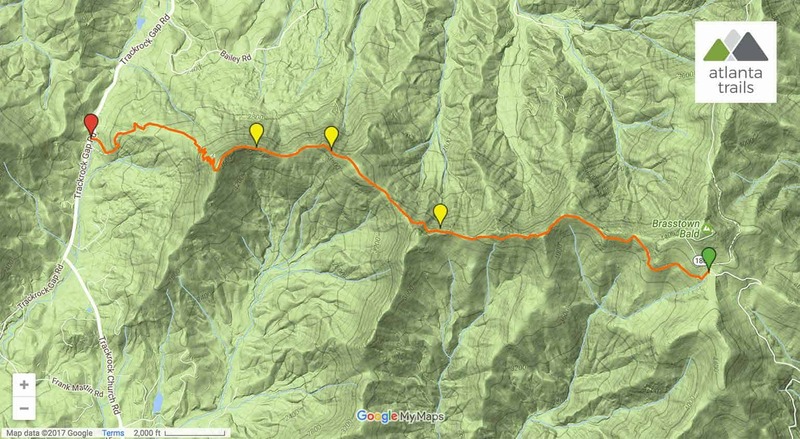 The hike reaches the trailhead at 11 miles, completing the adventure. 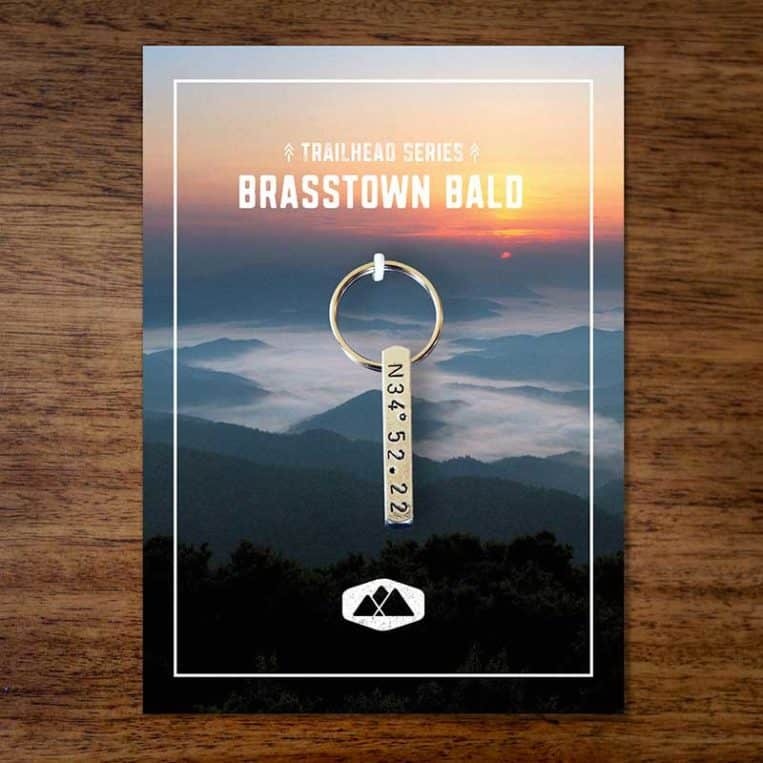 If you haven’t made the climb to the true summit of Brasstown Bald, it’s well worth the short workout. Views from the mountain’s top are incredible, stretching in wide, 360-degree panoramas from the old wooden fire lookout tower on the summit. $3 per person (daily) at the Visitor Center.